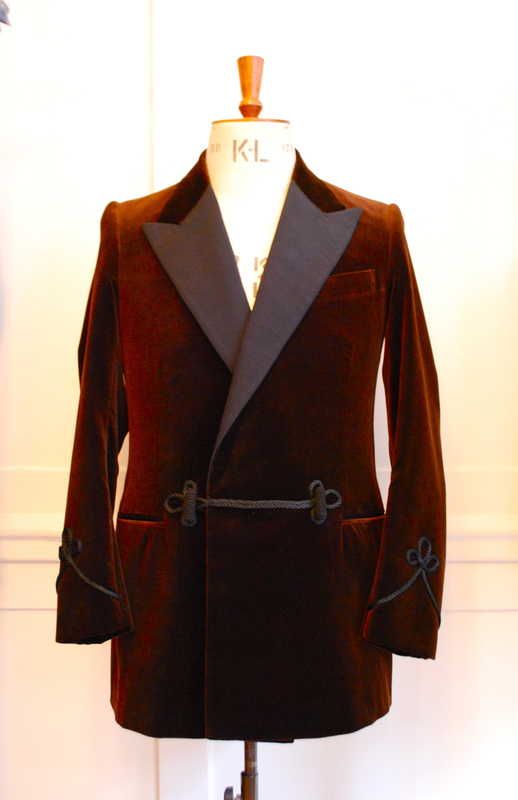 This was the fitting for a velvet jacket being made by Timothy Everest. I was pleased with the fineness of the velvet, the grosgrain facings and the contrast between the two. It felt very odd to have no vents on the jacket, both as regards the way it felt and the reduction in flair at the skirt. But I think that is simple unfamiliarity. We ended up changing a fair few points, mostly on the balance of the jacket rather than the fit. 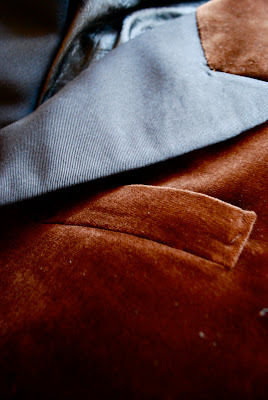 So one side of the collar was shortened slightly and one of the bottom hems brought up so the foreparts sat square and the silk cord matched up on the inside and outside (the jigger button attaches by a length of cord on the inside similar to that on the outside). Other minor changes included taking in the waist by a half inch each side and shortening one of the sleeves by the same amount. You can follow the discussion on Fitting at Timothy Everest by entering your email address in the box below. You will then receive an email every time a new comment is added. These will also contain a link to a page where you can stop the alerts, and remove all of your related data from the site. It reminds one of the kind of wonderful jacket Peter Cushing wore in his lounge as Baron Frankenstein. The lining looks very luxurious too. How is it meant to be worn? Is it indoor wear or something to wear as you would wear an odd jacket? Did you pay for it? If so, how much and how much is the retail price? Surely, you would not wear this outside your own house?! Also, that does not look like grosgrain on the facings. It looks like satin. I like how you’ve begun getting novelty type items made up bespoke. It’s almost like you skipped a step: the city suit. This is very impressive, along with the hunting suit. Beautiful, even though I’m not a fan of mixing black and brown. What do you plan to wear at the neck with this? Facings are grosgrain, apologies if the photography isn’t quite up to scratch. Yes I paid (or am paying!). Cost is £2300, Tim’s normal two-piece suits start at £2350. DudeMan, as I said this will be worn with black tie accessories, so a black bow tie. How terribly, terribly Noel Coward, dear boy – but are you going to wear it on the stage? Jed Hunkin. I found your blog thanks to this velvet jacket. Seems like I’ve opend the whole new world. Cant’s stop reading now! Thank you!